A 23-year-old non-English-speaking Vietnamese man came in with a scalp injury. Through an interpreter, he said he was playing basketball earlier that evening when he ran, head-on, into the basketball standard. He careened off and ran into a nearby fence, which he also hit with his head before landing on the ground. His friends took him home, shaved the area around the cut and made a compress of tobacco, which they placed in and around the wound. They then decided he should get it checked out and brought him to the emergency department. 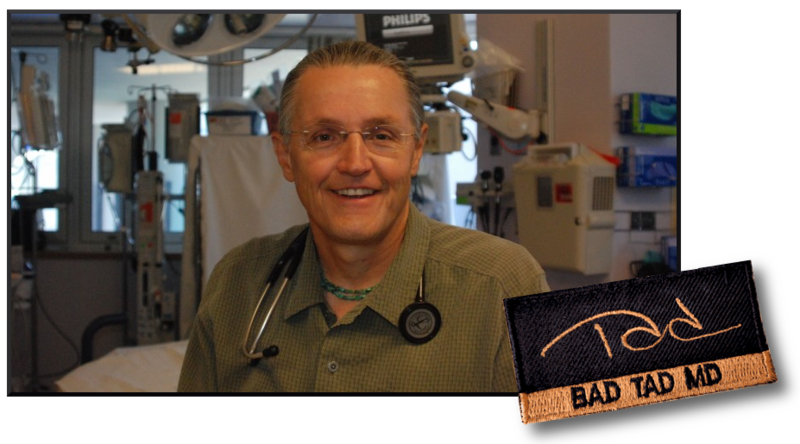 When his laceration was numbed and explored, a piece of metal was felt in the wound. X-rays and a CT scan showed a bullet embedded in his skull. He also had underlying brain damage. I called a neurosurgeon to take him to the operating room to repair of his injury. When confronted with evidence that he had actually been shot, he stuck firmly to his basketball story. I noted that he didn’t exactly fit the profile of a basketball player. He was just over five feet tall and was wearing flip-flops. Could he have been shot while playing basketball and not realize it? More likely, he was involved in some sort of shady activity that resulted in his being shot and just didn’t want anyone to know about it. It has been fun to try to think of ways to combine trauma straps with firehoses to make new bag designs. Here is what I came up with recently. This one is striped. It matches Shari’s shirt! My friend, Judd, has 80 gigabytes of digital cookbooks he has collected online. He culled from them the dozens that were cookie cookbooks and shared them with me on a thumb drive. 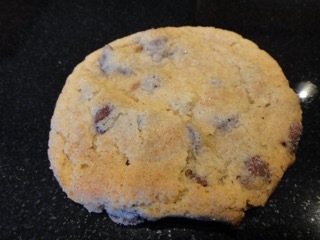 Here is a simple but fun recipe I tried that made a different take on a chocolate chip cookie. 1. Sift the flour, baking powder, baking soda, cream of tartar, and salt into a bowl and set aside. 2. In a stand mixer, cream butter and sugars on medium speed for several minutes until light and fluffy. 4. Add the flour mixture and mix on low speed just until combined. 5. Add chocolate chips and mix just until they are mixed in evenly. 6. Make dough balls 1 tablespoon, roll in hands, then roll in cinnamon-sugar mixture. 8. Preheat the oven to 350ºF. 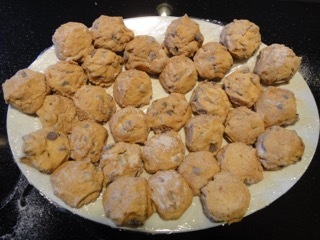 On Silpat- or parchment paper-lined cookie sheets, place dough balls 2 inches apart. 9. Bake for 8 to 10 minutes, rotating sheets halfway through, until golden brown. As in most cases, I am not sold that chilling these made any difference. First, even after almost an hour, they balls were really not chilled all the way through. Also, I baked one not chilled and it seemed no different than the chilled ones. Chilling, especially after rolling them out, really makes it a lot more hassle to make these.